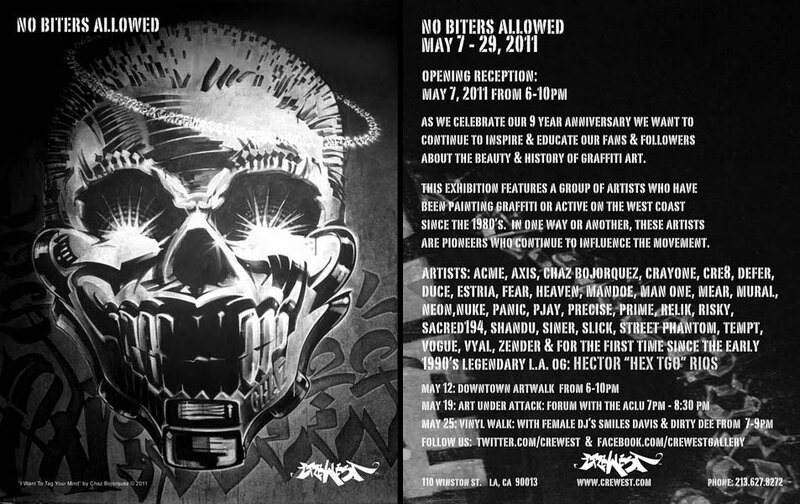 Alex DEFER Kizu exhibited work in the CREWEST show “NO BITER’S ALLOWED” on May 7, 2011. This show marks the 9th anniversary of CREWEST and featured the work of West Coast graffiti artists who have been painting since the 1980′s. 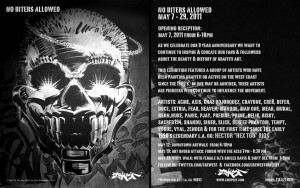 ACME, AXIS, CHAZ BOJORQUEZ, CRE8, DEFER, ESTRIA, FEAR, HEAVEN, MANDOE, MAN ONE, MEAR, MURAL, NEON, NUKE, PANIC, PJAY, PRECISE, RELIK, RISKY, SACRED194, SINER, SLICK, STREET PHANTOM, TEMPT, VOGUE, VYAL, ZENDER…and the legendary Hector “HEX” Rios.